Be sure and check the Parker 51 Parts page for Vacumatic 51 parts also. ITEM #BUSH 3-56: PARKER CLIP BUSHINGS. These have the more commonly used smaller diameter inner threaded hole. The outer thread fits most standard sized Parker fountain pens and also pencils and ballpoints. To buy please email Pentooling. Be sure and provide a shipping address including city and state/province so we can calculate shipping costs and get your order to you. Ande please make sure that Paypal has your correct shipping address as I use them to geneerate my shipping labels. 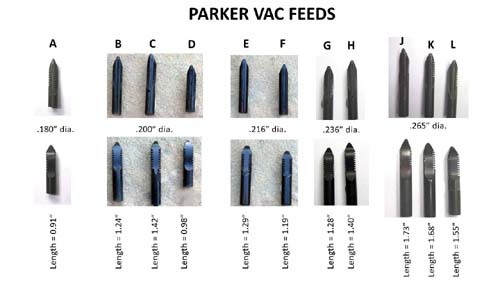 ITEM #VACFEED: PARKER VACUMATIC FEEDS. These come without fill tubes; if you know the length of fill tube you need and want to order one, that's $5 additional for an original. A = .180" X 0.91"
B = .200" X 1.24"
C = .200" X 1.30" to 1.35"
D = .200" X 0.98"
E = .216" X 1.29"
F = .216" X 1.19"
G = .236" X 1.30"
I also have a CLEAR Vac feed .235" dia. X 1.31" long - email me for a price. H = .236" X 1.35"
J = .265" X 1.73"
K = .265" X 1.68"
L = .265" X 1.55"
To buy please email Pentooling. Be sure and provide a shipping address including city and state/province so we can calculate shipping costs and get your order to you. INTERNATIONAL BUYERS PLEASE INCLUDE YOUR PHONE NUMBER SO YOUR POSTAL SERVICE CAN NOTIFY YOU WHEN REQUIRED. ITEM #LOCKDOWN: PARKER VACUMATIC LOCKDOWN FILLING UNITS. Available in all 3 sizes (there are 3 sizes, with the measurments specified here as the outer diameter of the threads on the filling unit side that goes into the barrel; most of us will only deal with the standard size and the oversized. The middle size was used early on), with the sizes being 0.355" (Standard), 0.395" (Medium), 0.425" (Oversized). The Standard sized have a dull aluminum finish, the Medium sized and Oversized have Chrome finishes. These all have crisp, sharp lockdown slots and cut outs. ITEM #STD. VAC FILLER: A NEWLY MANUFACTURED BRASS VERSION OF THE PARKER STANDARD SIZED VACUMATIC FILLING UNIT. Soup up your old Vac with this state of the art version of the smaller of the two thread sizes of the Vac filling unit. Identical in fit and function to the original non-Speedline, non-lockdown filling units. Brass and Ebonite with a new spring. ITEM #O.S. VAC FILLER: A NEWLY MANUFACTURED BRASS VERSION OF THE PARKER OVERSIZED (AND MAXIMA) VACUMATIC FILLING UNIT. 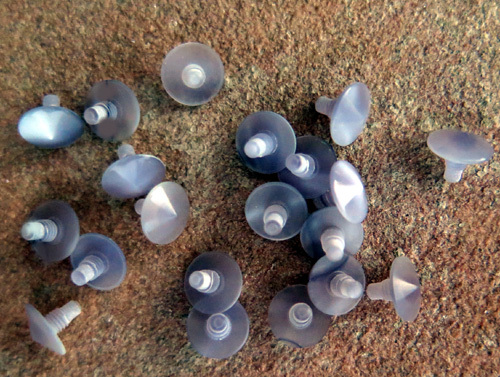 The larger of the two thread sizes of the Vac filling unit. Identical in fit and function to the original non-Speedline, non-lockdown filling units. Brass and Ebonite with a new stainless spring. ITEM #STD. VAC FILLER - BLACK: A NEWLY MANUFACTURED CLASS III HARD COAT ANODIZED ALUMINUM VERSION OF THE PARKER STANDARD SIZED VACUMATIC FILLING UNIT. Soup up your old Vac with this state of the art version of the smaller of the two external thread sizes of the Vac filling unit. Identical in fit and function to the original non-Speedline, non-lockdown filling units. New Aluminum and Ebonite with a new spring. ITEM #STD. VAC FILLER - RED: A NEWLY MANUFACTURED CLASS III HARD COAT ANODIZED ALUMINUM VERSION OF THE PARKER STANDARD SIZED VACUMATIC FILLING UNIT. Soup up your old Vac with this state of the art version of the smaller of the two external thread sizes of the Vac filling unit. Identical in fit and function to the original non-Speedline, non-lockdown filling units. New Aluminum and Ebonite with a new spring. Note: This is NOT a Redband filling unit replacement!! If you have trouble popping the new combined ball/diaphragm combination into these (or original Parker black hard rubber or celluloid versions),Start out going into the opening GENTLY with a #39 drill bit and work your way up to a #33, turning them with your fingers. (and don't push it too far in; you only need to do the opening). ITEM #VAC SPRING: REPLACEMENT SPRING FOR PARKER VACUMATIC FILLING UNIT. Replacement spring with the same form, fit, and function as the original, if you're into digging into your Vac filling unit this deeply. The rest of the filing unit parts shown in the photo are not included. ITEM #51 SHELL BLK: NEW OLD STOCK BLACK SHELLS / HOODS FOR PARKER 51s. Fine thread for standard size 51s. Won't fit the Demi. These are 48 threads per inch. ITEM #51 SHELL, COCOA: NEW OLD STOCK COCOA SHELLS / HOODS FOR PARKER 51s. Fine thread for standard size 51s. Won't fit the Demi. These are 48 threads per inch. I may have a few other colors, but please don't email me looking for Buckskin, Mustard, Plum, or Empire Green; If I had any of those, they would be listed as seperate items with lit-up, blinking, neon borders around the listings. If you know of a source for any of those, please let me know. ITEM #51 FEEDS: PARKER USED A ZILLION DIFFERENT LENGTHS OF FILL TUBES. Most of the feeds are the same except for some very rare early versions that had no channel running the length of the top. The front, flat, pointed part of these early ones are much thinner (depth of the flat part), .06" in the early ones as opposed to .1" on the later ones. I don't have any of the early ones for sale. New tubes for the Aerometric feeds are sold separately (above). ITEM #FILL TUBES BY FOOT: FLEXIBLE FILL TUBES FITTING VACUMATIC AND SKYLINE FEEDS. Order it by the foot. I find that holes in the backs of feeds vary from feed to feed; if you need to make this tubing thinner, hold it over a heat source and stretch it and it will get thinner. You can then cut it at the desired diameter. ITEM #51CLIPSCREW: VERY GOOD REPRODUCTIONS OF PARKER 51 JEWELS (REFERRED TO MORE PROPERLY AS "CLIP SCREWS" IN PARKER SERVICE MANUALS). These photos were shot from 3 different angles so you could detect the irridescence in the grey/silver/swirled plastic. For comparison purposes, about half the jewels in each photo are reproductions and about half are originaal Parkers. These have the smaller of the two thread sizes that 51 clip screws came with, although most 51s used this size. The larger size was used for a very short while early-on. If you need to replace one with the larger thread size because your bushing has the larger threaded hole, we also sell the bushing with the smaller hole so you can replace both bushing and clip screw (next item, below). The outer threads of these replacement bushings are the same size as those used for both sizes of inner bushing hole.